The Yangon Stock Exchange, the first of its kind in Myanmar, aims to start trading by October 2015 and will begin with a starting capital of 32 billion kyat ($32.5 million), according to Maung Maung Thein, the country’s deputy finance minister. Japan’s Daiwa and Tokyo Exchange will help support Myanmar’s new stock exchange and have invested into a 49 per cent stake in the venture. A draft contract is awaiting approval from the president’s office. “The exchange will be established with a starting capital of 32 billion kyat with Myanmar’s 51 per cent stake and Japan’s 49 per cent stake. They have sent a draft contract to us. We’re now preparing after we get approval from President’s Office and Chief Lawyer’s Office for it, we can start running it,” Maung said. The deputy minister added that local companies were in need of training and information on how the stock exchange would operate and the standards required for companies to get listed. “There are standards for the companies to be listed in the exchange. Not every company will be listed. Only companies which meet the standards will be allowed registration for the exchange,” Maung added. 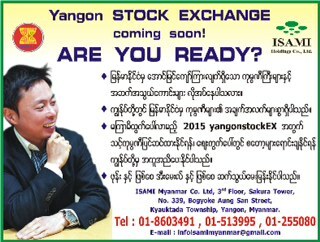 Though there are 105 public companies in Myanmar, only about ten are qualified to be listed on the exchange.